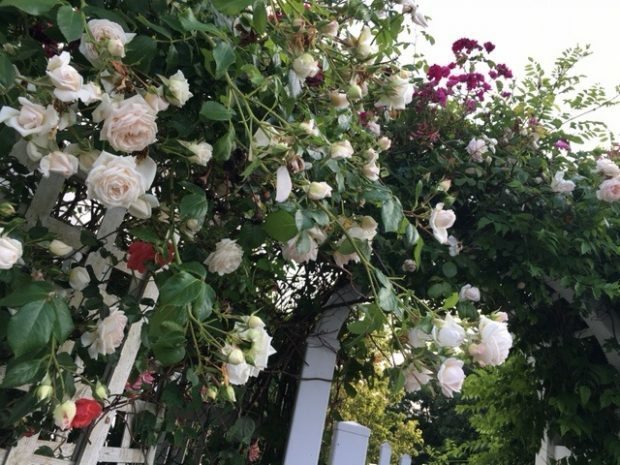 I am trying to get into la la land of summer between the constant buzz of beautifying client’s homes. It is a busy season in the studio and out, but as busy as I am (and I’m not complaining, busy is good) I can’t not stop and dream of colorful exterior landscapes, which we are feverishly working on also with outdoor seating areas, al fresco dining and all the right lighting. I’ll save those project pics for another post but for now, let me love on the flowers of summer! After all, we are abundant in color in the Hamptons and all of Eastern Long Island. 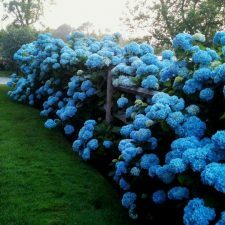 Hydrangeas, a favorite seaside beauty, are just starting to flourish and their mix of feathery blue hues is a sure fire signature of summer. What beach house doesn’t have the fat blue blooms? Of course they come in a myriad of pinks and whites too these days but blue is our is Hampton’s signature. 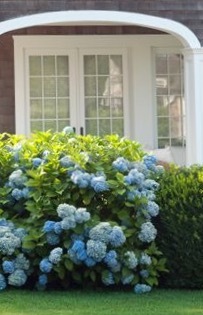 With summer comes this abundance of changing color in landscapes that I love, and not just from the beloved hydrangea. Color is everywhere you go, whether down Montauk Highway, Dune Road or all the glorious streets in between. It is all flowers, flowers and more flowers. Black Eyed Susan, lavenders and daylily, to name a few, are among my favorites that give gardens long lasting color. Can you tell I am a big fan? 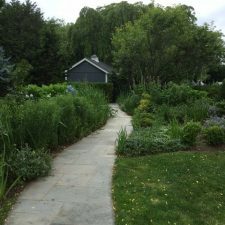 What I’ve learned as a not so amateur gardener myself is that adding moving colors to your landscape can keep color abundant all summer long. By this I mean different flowers, shrubs and trees that bloom at different times so you always have color before the fall fades everything! 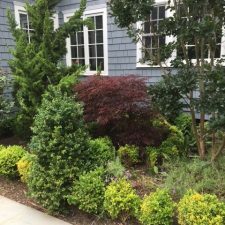 Don’t get me wrong, I love a good, coppery autumn hue but nothing says summer outside to me like a Long Island landscape, perfectly manicured or wildly not! Take a peek at some of my favorites. Excuse some of the photograph’s grainy appearance. Some of these shots were unplanned beauties or taken on overcast days but hopefully you get the picture! 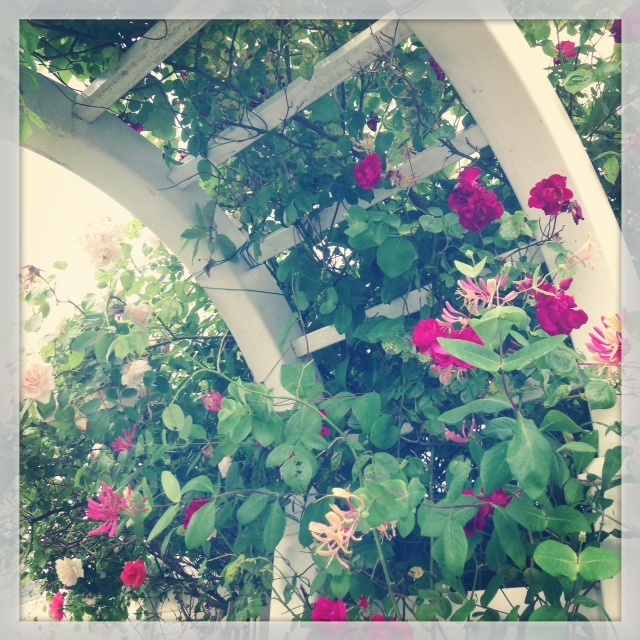 I love this arbor of wildly, untamed mixed roses and honeysuckle. The owner tells me she often attracts the hummingbirds too. Seriously! And here are the seaside blooms I was raving about. 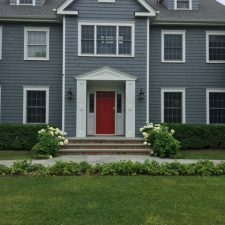 Tell me you don’t think of summer parties on the lawns of great Long Island homes sipping cocktails! I have sipped a margarita or two amongst the great blooms. I get giddy walking the grounds of this lovely Southampton home. 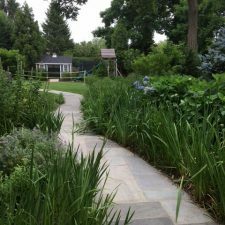 It has the perfect mix of shrubbery, perennials and trees. Thank you to my friend Courtney for these pictures. 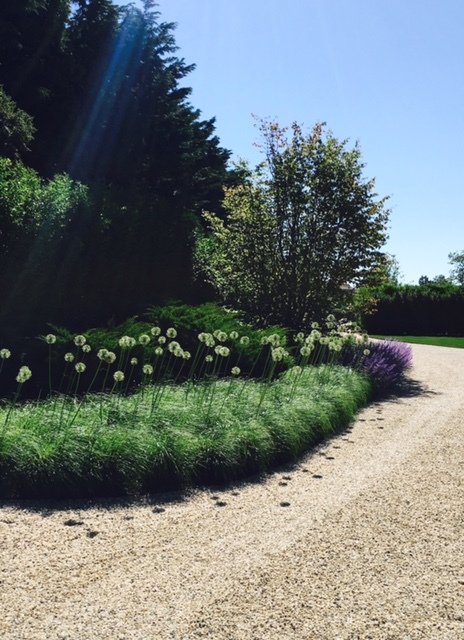 The impressive landscaped Southampton driveway below, courtesy of Peconic Lawn & Tree Care, http://peconiclawncare is abundant in welcoming blooms. Allium, those giant mop like flowers pictured below, don’t last long in color but the fat bloom stays to greet you all summer long. I love that. 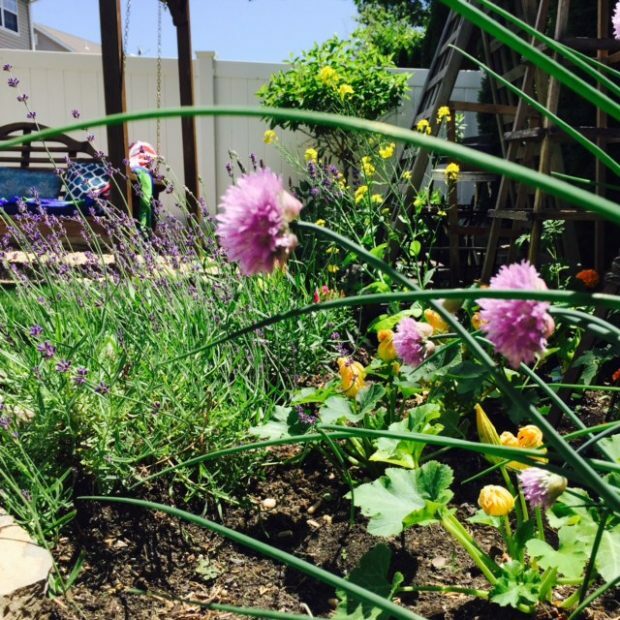 This mix of chives and lavender planted amongst a vegetable garden give pretty, purple hues before the edible abundance. I like the idea of mixing perennials or even all summer colorful annuals in with the vegetables. You get the best of both worlds! The outdoor swing in the background that we found a few years ago for our client has the perfect view. 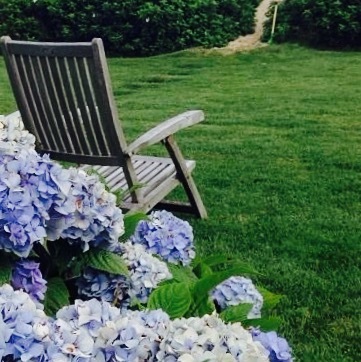 To the left of the swing hovers a hydrangea tree. Once those babies come out, this setting is so alive with color. Okay, now I know I said I would wait for another post to share some outdoor decor spaces but I can’t help but post a glimpse of an al fresco dining area with some potted annuals. 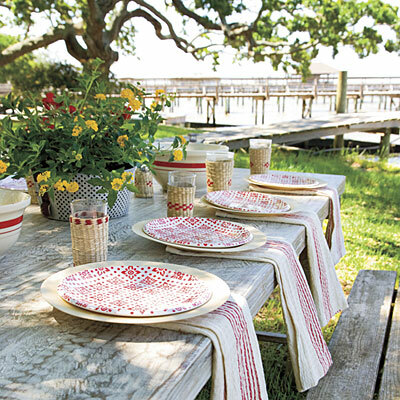 And of course the dock backdrop doesn’t hurt the summery ambience! Well, enjoy your outdoors landscapes. Like summer, they can change fast! Previous Post: « Bringing the Beach Indoors.